I had heard about the Coder Dojo initiative to encourage young people to learn computer programming skills when they are young and have not yet acquired negative prejudices about the difficultly involved. This is a great initiative and so I offered to help run the local Dojo in Dublin 15, but for various logistical reasons I wasn't able to attend out until this Saturday (which was the last in the current series). There was an impressive turn out of 45 students on a rare day of bright sunshine when I could easily see that the alternative possibility of a trip to the beach might have seemed to be more attractive than spending the day indoors working on your laptop in a poorly ventilated room. The lecturer went through a short course on HTML and CSS while and a batch of about 10 mentors (including me) were available to assist the students as they attempted to complete the exercises. The students ranged in age from about 8 to 12 and they all seemed to be very keen to engage with the materials. Obviously there was some variation in the ability of the students, but none had any difficulty in completing the exercises with minimal support from the mentors. 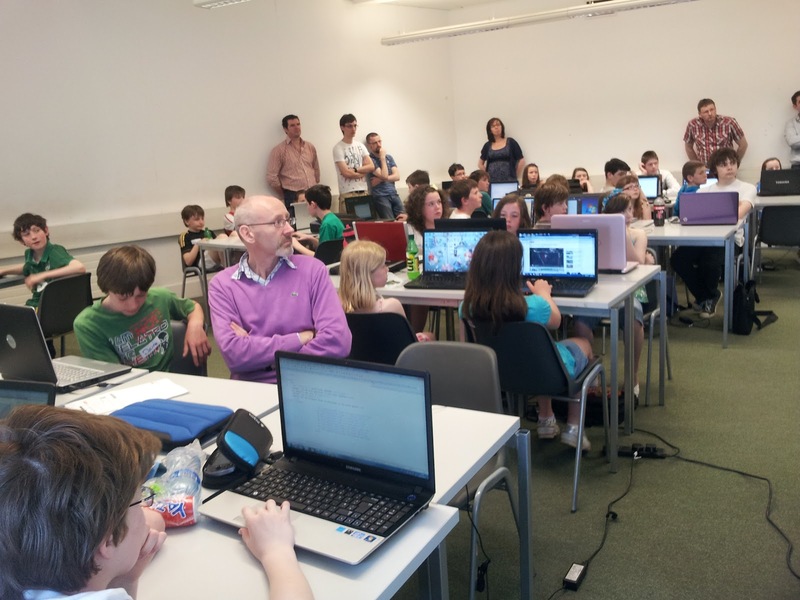 My friend Speedie blogged about how the Galway Coder Dojo was helping to promote father/son bonding. It seems that it is mainly the fathers who take on the responsibility for bringing children Galway event, but thankfully the gender bias does not seem to be quite as strong in Dublin 15. I did a rough tally of the gender profile and estimated that the male students outnumbered the female students by about 60% to 40%. The gender bias was slightly higher among the accompanying adults (roughly 75/25) but the mothers were certainly well represented. I was a little disappointed to see that all of the mentors were male, but maybe the gender bias will be receding when the current batch of students grow up and start becoming mentors themselves. Overall I must say I was very impressed by the event and re-assured that Ireland's computer industry has a bright future. I can echo those comments - we're running one in Athlone for the past few months and I'm mentoring one of the Scratch rooms - it's really enjoyable to do with both kids, mentors and parents getting a buzz out of it. In fact some parents rae evening following along on own laptops :) I'm also seeing a split in the kinds of projects the kids gravitate to - boys to games and girls to interactive book type apps. Jerh - I am delighted (but not surprised) to hear you are involved in this movement. It is great to see young people being so enthusiastic about software. I also noticed a gender divide in the web sites being built. The boys favour sites about games, but the girls tended to favour bands.